The Bucks defeated the Jazz 114-102 tonight in Milwaukee. Giannis Antetokounmpo led all scorers with 30 points (13-30 FG), to go along with 10 rebounds, 2 assists and 2 blocked shots for the Bucks, while Malcolm Brogdon contributed 21 points (8-14 FG), 5 rebounds and 5 assists. 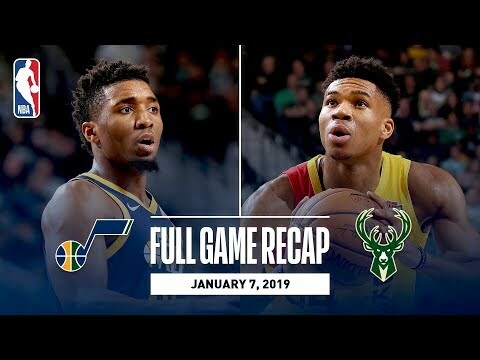 Donovan Mitchell led the Jazz with 26 points (8-24 FG, season-high 6-12 3pt FG), to go along with 3 rebounds, while Rudy Gobert tallied 14 points (4-8 FG), 15 rebounds, 3 assists and 2 steals. The Bucks outscored the Jazz 19-2 in fastbreak points and 68-36 in the paint. With the win, the Bucks improve to 28-11, while the Jazz fall to 20-21 on the season. LIVE on NBA on TNT: A doubleheader featuring Celtics - Heat and Thunder - Spurs!